Yeah Judas, it’s definitely on the small side. I’d say saving up for a 560 is the way to go – the 0550 is a nice option as well. Thanks for stopping by and commenting man – always a pleasure! The rub is almost always in the area of manufacture. Good knife designs can produce a good product even from low end materials so long as the product is made correctly. But even the best design, made with the best materials, is nothing if it isn’t made correctly. Too bad about this one. But Kershaw has plenty of designs just like this. They could be truly great with just a bit MORE. Good review. I won’t be picking one of these up. I hear ya RK. That is definitely the rub unfortunately. I have heard rumors about a “Cryo 2” – lets hope it’s made right in the USA. That would be killer imo. Thanks for stopping by man, great to hear from you. Yes, there is supposed to be a Cryo 2 with a 3.25-inch blade on the way soon. Great review Dan. I think that this one is too small for my preference, so I will get the larger one eventually. Thanks for the info Greg! I tend to agree with you on the size, and think a larger version sounds intriguing. 3.25″ is a real sweet spot – especially when considering the 0550 and 0560. I hope they change up some other things besides blade length. I know I’m not the only one willing to pay a premium for quality. I was initially psyched by the Cryo. It looked good, and totally different from other budget Kershaws. I’ve got plenty of 8cr knives, and I really like the steel. For light edc use, it’s probably one of my -if not my most- favourite steels for small and light edc-type knives. The Cryo did not really meet my expectations. It’s heavy for its size, making a lot of other knives a better option. On top of that, this is the only knife I’ve had that rusted on me by just lying in a drawer. Two weeks ago I decided to pick it up again and give it another try, and there were rust spots all over the edge, even on the coating. I immediately checked my other 8cr knives, no problem there. I checked my carbon blades in the drawer, not the slightest spot of rust. I took the rust of and coated the blade with a bit of mineral oil, but I was bummed by this discovery. This is my first Kershaw with 8cr, and probably my last for this exact reason. There are many other compagnies that have their 8cr done right. On top of that, I find the bladeshape nice to look at, but not extremely convincing for edc usage. There are better drop points out there. As you said as well: the blade is not centered, nor can I adjust it to the point where it’s perfectly centered. Thanks so much for stopping by and offering some thoughts and experiences on the Cryo. Unfortunately, I pretty much agree with all of them. I haven’t had any issues with my blade rusting, but I’m not particularly impressed with the knife in many other aspects (many of which you mentioned here). For me it’s a novelty item, and perhaps used as a yardstick to compare better offerings (case in point, I recently reviewed the Kershaw Turbulence – far superior, especially when placed next to the Cryo). Oh well, that’s the way it goes sometimes! Listened to your review and have been looking at purchasing this knife and the new Cryo II when it hits the market for general usage. A comment regarding the thumb studs though. Not being left handed, I would suspect the thumb studs to be more useful to me. Since I am handicapped in that regard, I have never really looked at a knife thumb stud for left hand opening before. If there is no issue with other Kershaw designs and left handedness, then it is indeed an oversight on Kershaw’s part in the design phase. 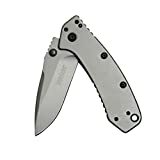 I have the same issue with the ZT 0560 that I just purchased, in that the thumb stud doesn’t give me the leverage that I would want to open the knife, which leaves me with the flipper to get the job done. On the Cryo, I’d suspect that since it’s an assisted opener, most folks will use that route as well, just because it’s more fun. Like the knife and again plan on getting it and it’s big brother to add to my personal collection. Thanks for your kind comment. I noted difficulty opening the knife with my left or right hand. A couple other people who owned the knife also had some issues with it. Since publishing the review several people have notified me that they can use the thumb studs without a problem, so perhaps they will work well for you too. Just calling it like I see it my friend – I hope it works out for you if and when you decide to purchase the knives.